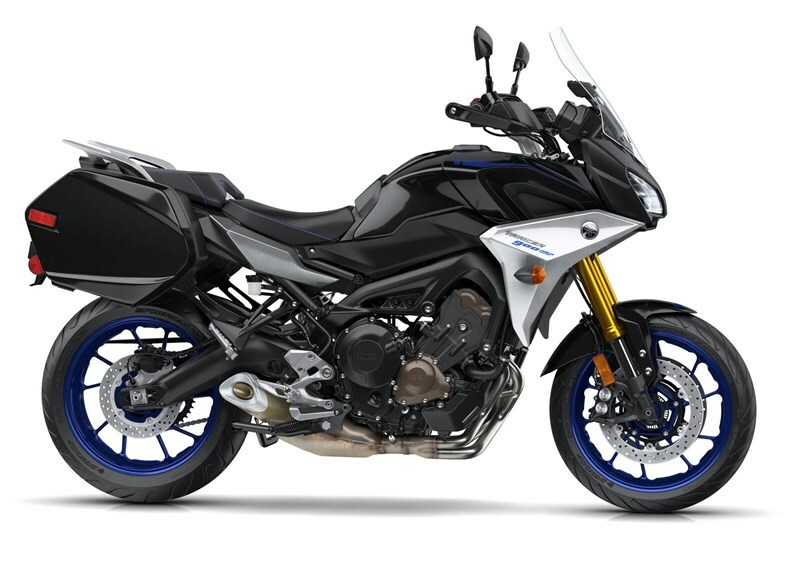 The Tracer 900 GT features an 847cc liquid-cooled, inline 3-cylinder, DOHC, 12-valve engine derived from the award winning MT-09. 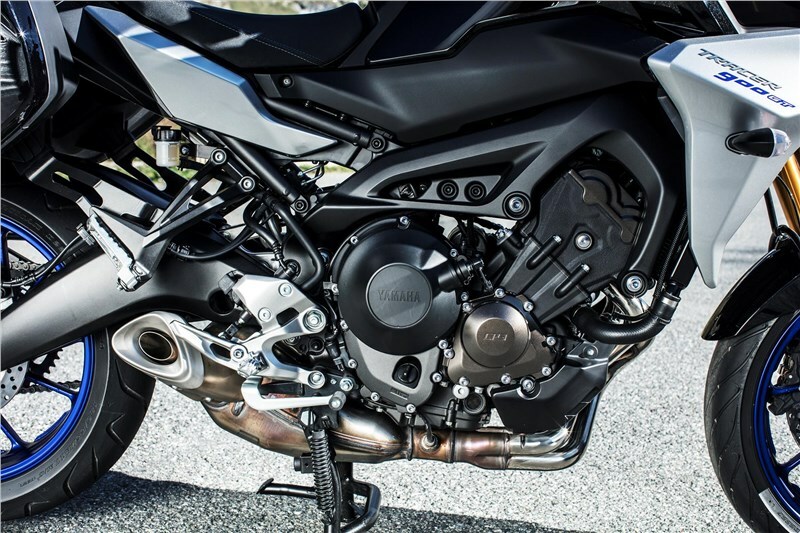 This engine combines high-tech components such as offset cylinders, fracture-split connecting rods and staggered intake funnels with a crossplane concept crankshaft to deliver an exciting, sporty engine character with plenty of torque for flexibility and relaxed highway comfort. 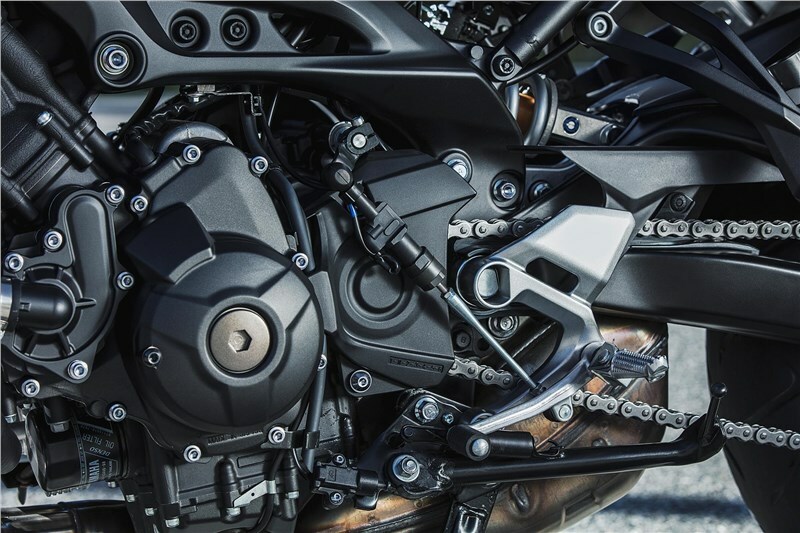 The Tracer 900 GT “crossplane crankshaft concept” engine provides linear torque development in response to the rider’s throttle input, for responsive engine thrust with a strong feeling of power in the low- to mid-rpm range. To boost refinement and provide a smoother ride, the CP3 engine uses a compact counterbalancer to cancel out vibration. The Tracer 900 GT transmission gearing takes full advantage of the low-to-midrange torque of the CP3 engine, while being designed to be very compact: the crankshaft, input and output shafts are “stacked” in a triangular layout to centralize mass and keep the engine shorter front-to-back, which allows optimized engine placement in the frame for outstanding handling. By placing the muffler low in the frame and as close to the center of the machine as possible, overall handling is improved. 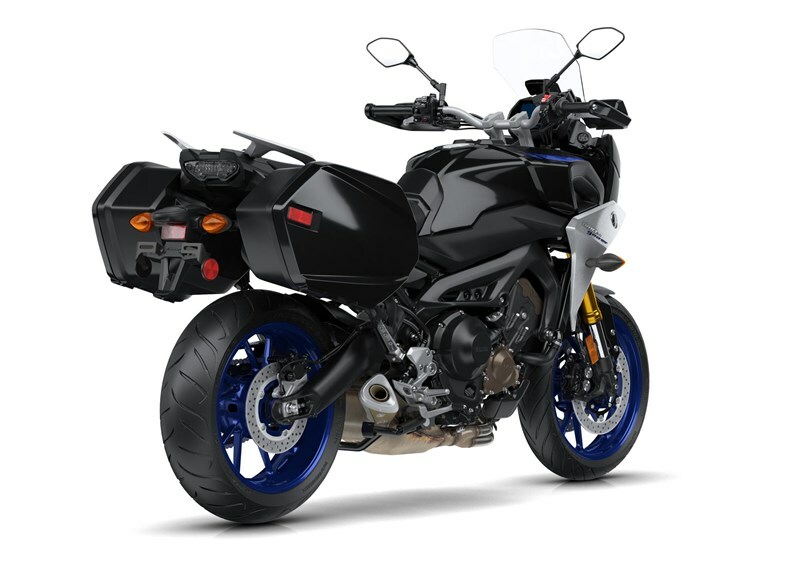 Featuring a short, slash-cut exhaust outlet, the Tracer 900 GT sings out with a sporty 3-cylinder exhaust note, too. 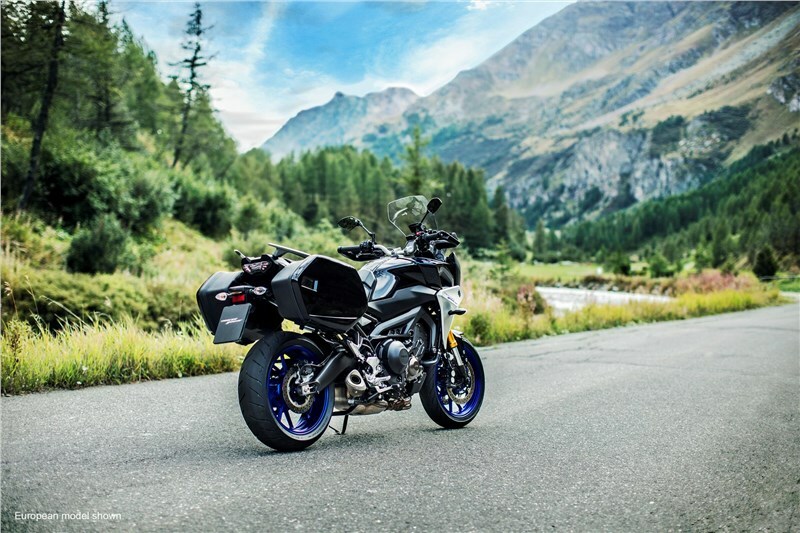 The Tracer 900 GT uses a new fully-adjustable front fork derived from the MT-09. The 41mm inverted fork now features compression damping adjustability in addition to the rebound damping and spring preload adjustments. Not only does this allow riders greater flexibility in tuning their Tracer, the new fork design separates compression and rebound damping into separate fork legs, making it easier to fine-tune for the perfect setup across all 5.4 inches of fork travel. 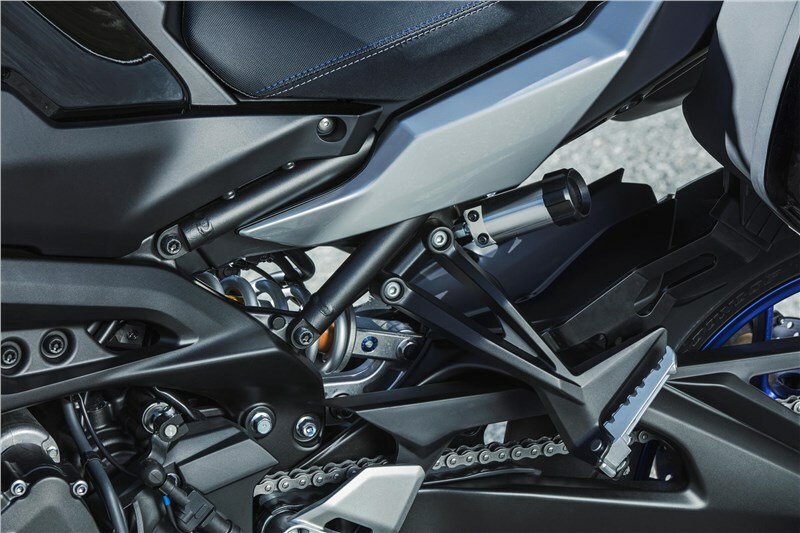 The rear suspension features a linked-type Monocross® shock, positioned below the seat with an almost horizontal alignment. This unique positioning contributes to mass centralization and a slimmer body design. Already adjustable for rebound damping and spring preload, the new Tracer 900 GT also features a remote preload adjuster, allowing easy, tool-less adjustment for various loads. Front brakes consist of paired floating 298mm discs with 4-piston calipers. 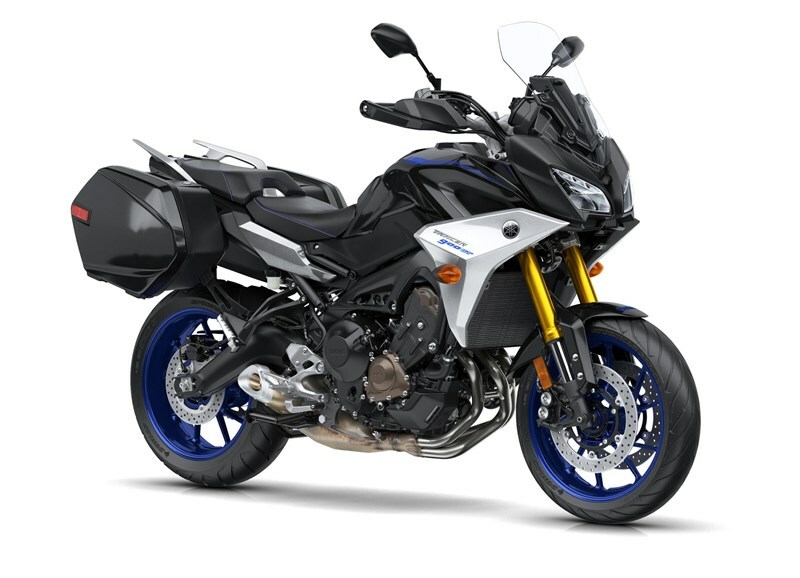 The calipers are radial mounted for improved feel just like Yamaha’s race-winning supersport machines. 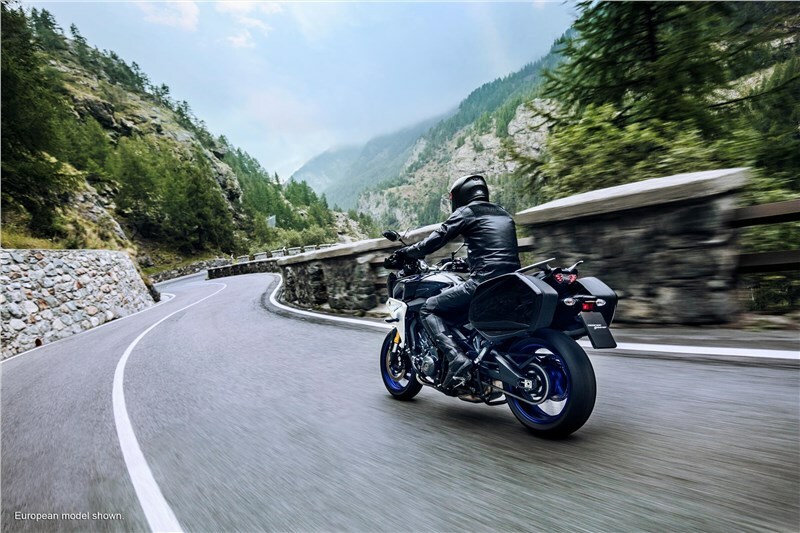 Yamaha’s anti-lock brake system (ABS) works to help prevent wheel lock during hard deceleration for additional braking security. 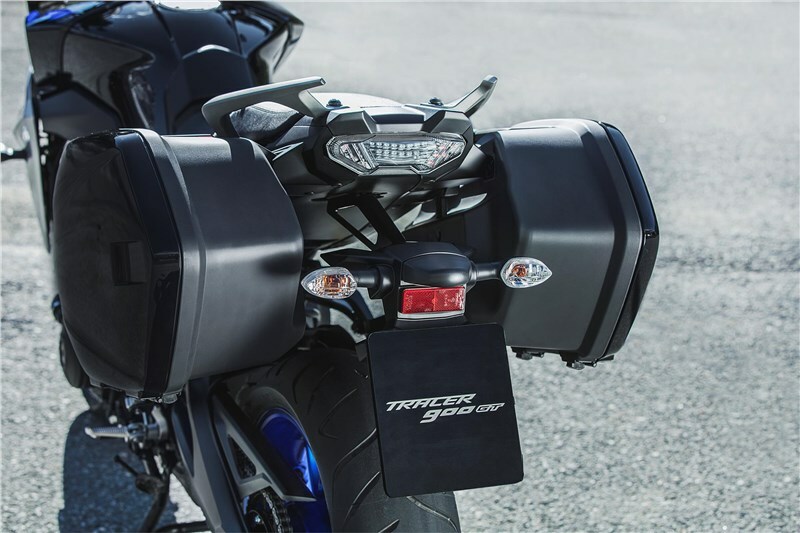 Large 4.8 gallon fuel tank provides generous range for fewer stops on the open road. 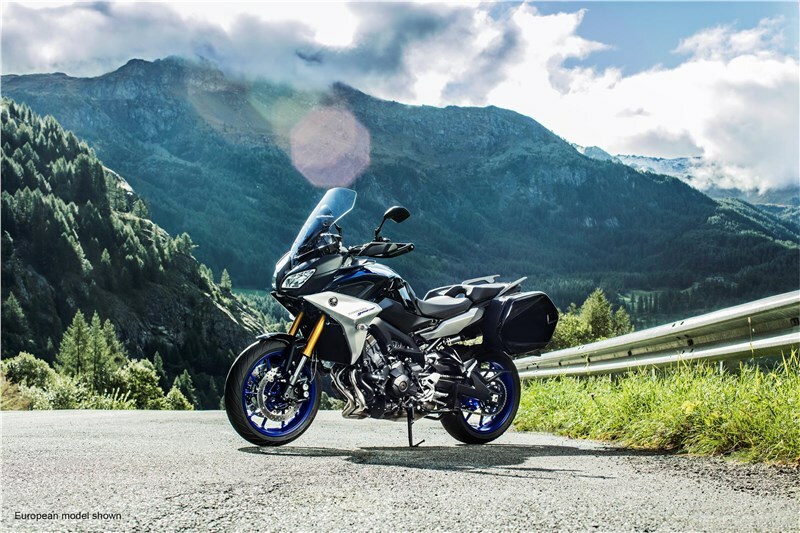 The Tracer 900 GT aluminum frame utilizes Yamaha’s Controlled Fill vacuum casting technology to create a strong, compact chassis with the engine as a stressed member for balanced rigidity. 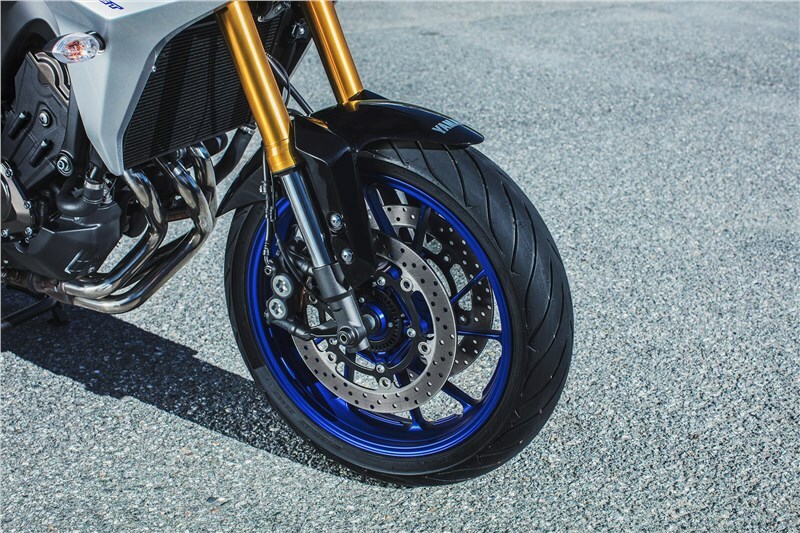 A new, longer swingarm improves the feeling of drive from the rear tire. 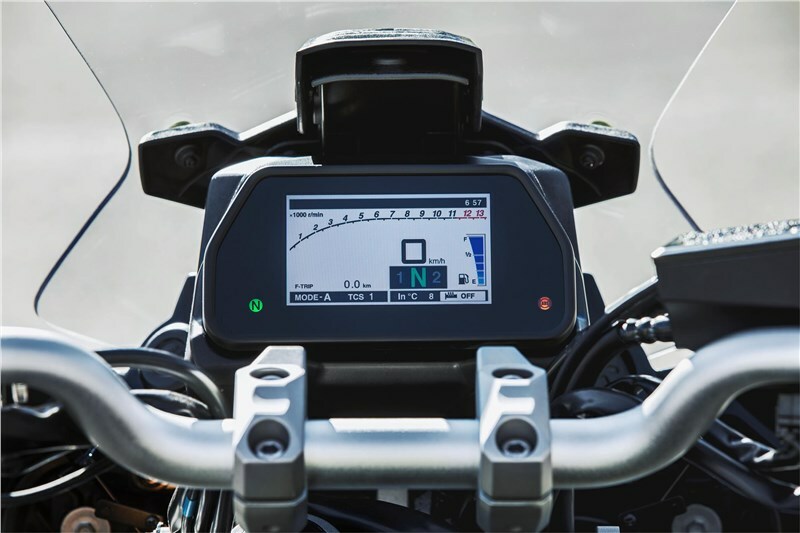 The tapered aluminum handlebar is narrower for 2019 and features lighter, sleeker handlebar guards to match, along with adjustable heated grips controlled through the new TFT dashboard. 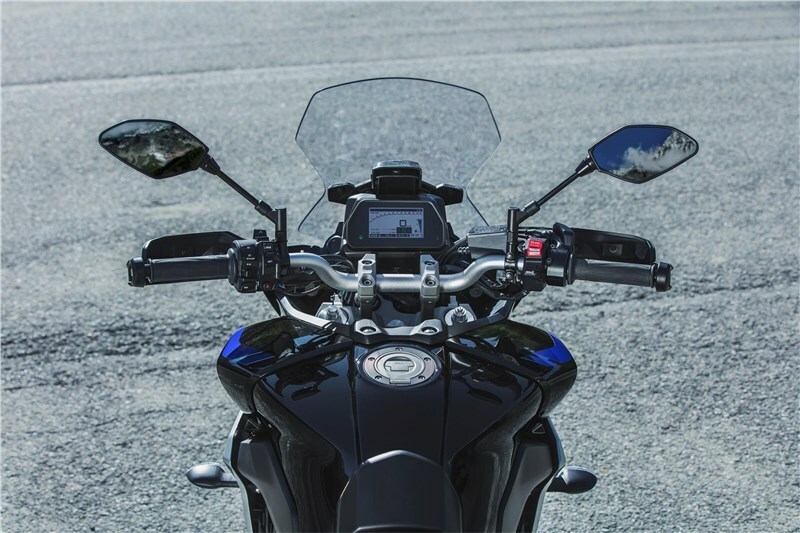 The handlebar mounts are adjustable laterally between two positions to accommodate different rider preferences, while the rider’s seat can be easily adjusted 0.6 inches up or down for additional legroom. 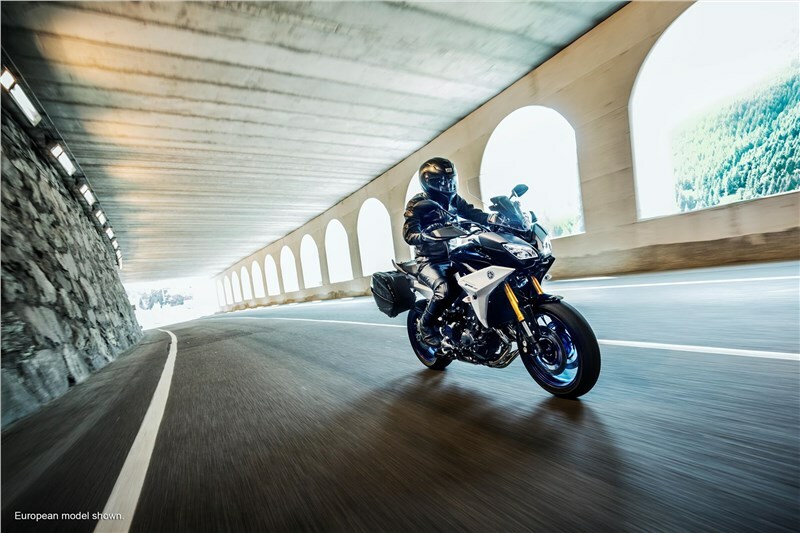 Passenger legroom is also improved for 2019 thanks to revised passenger footpeg positioning. 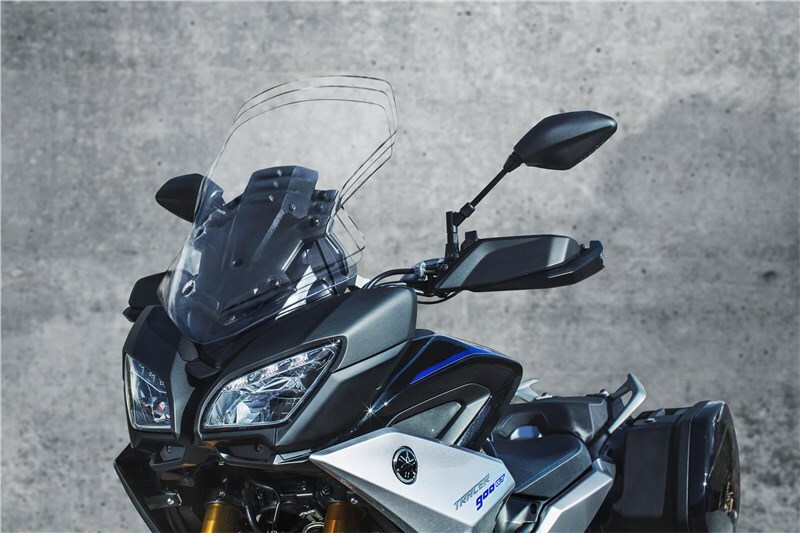 The new windscreen is now taller, for improved wind protection and features a new one-handed adjustment system to three positions without the use of tools. Front nose to tail, the Tracer 900 GT features updated bodywork for a higher-quality, more cleanly integrated design. 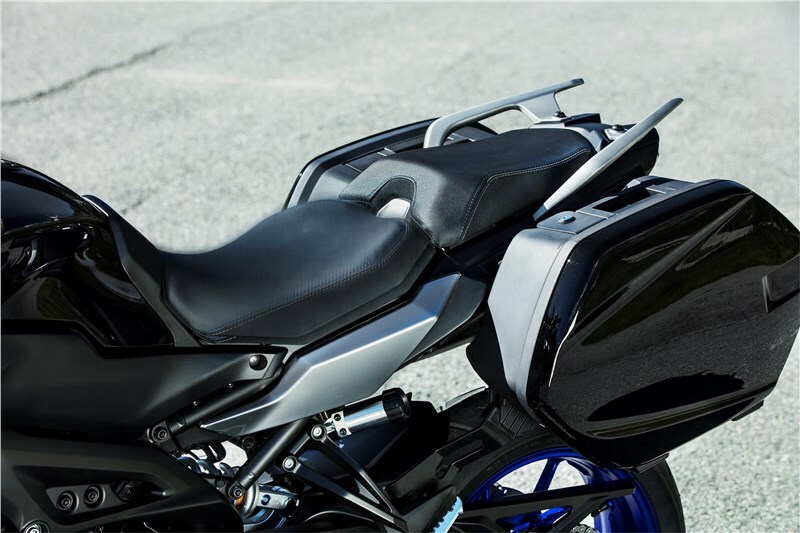 Locking color-matched side cases feature cleanly integrated luggage mounts, making the Tracer 900 GT ready to hit the road straight from the factory. 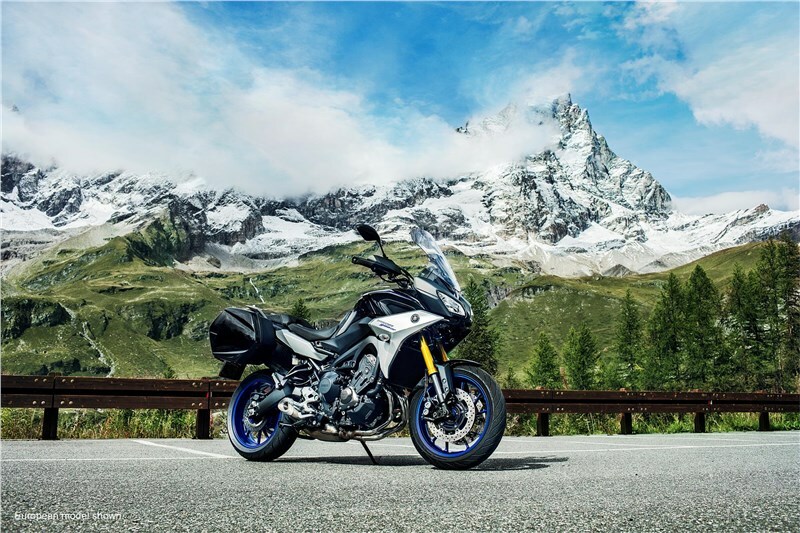 The Tracer 900 GT comes standard with a centerstand for added rider convenience when parking or performing cleaning and maintenance. A 12V electric outlet, mounted adjacent to the instrument panel, comes standard to conveniently power a range of electrical accessories. 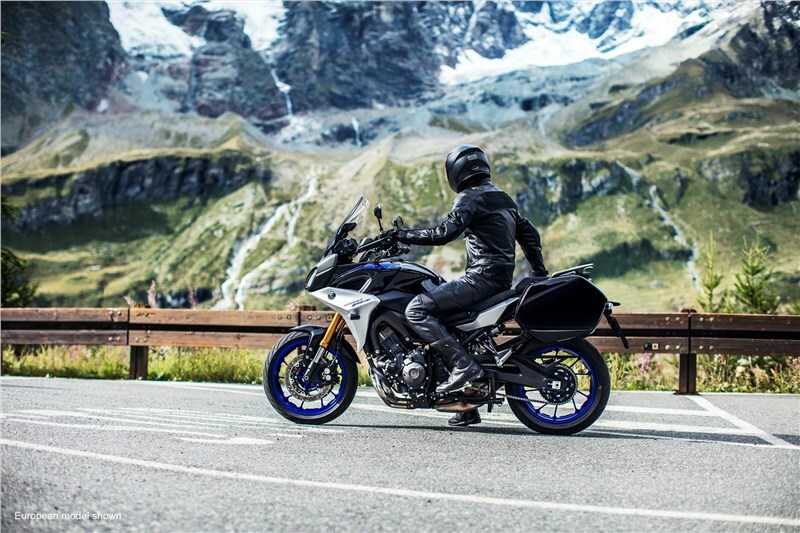 The Tracer 900 GT is ready for a range of Genuine Yamaha accessories, including windscreens, luggage and more. 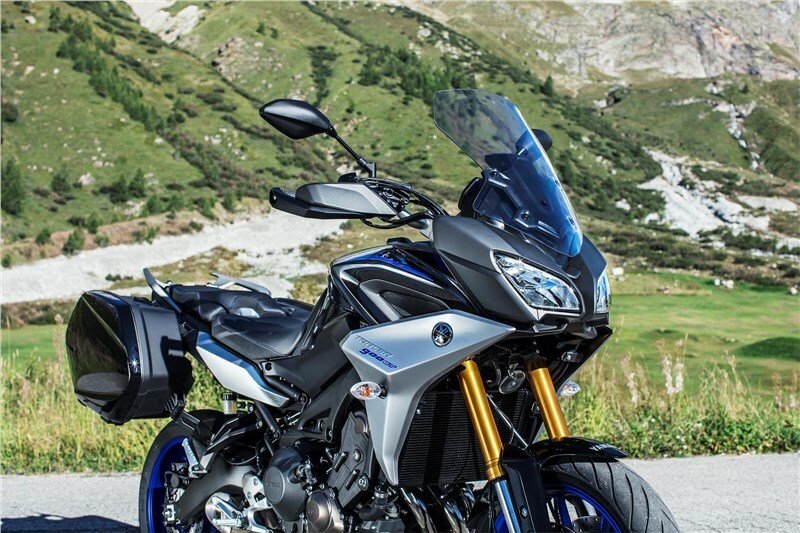 The Tracer 900 GT is equipped with Yamaha D-MODE (or “Drive Mode”) variable throttle control system. 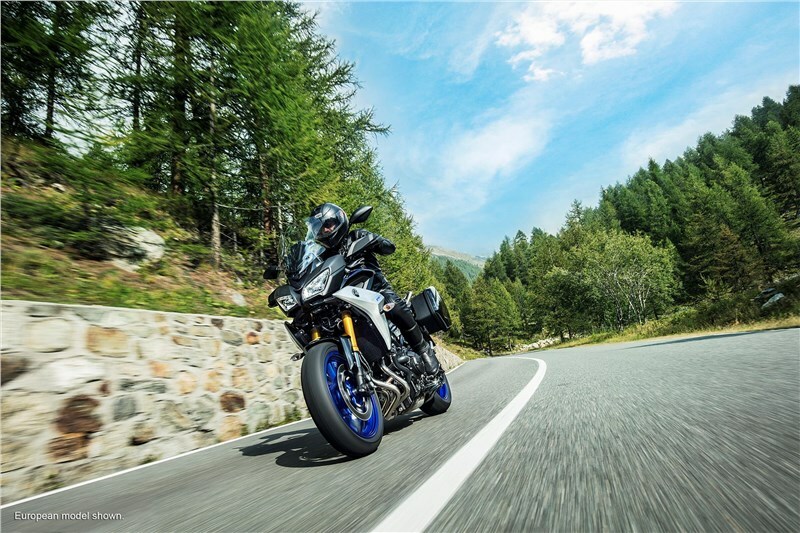 The rider can select at will from three throttle valve control maps for different performance characteristics each tuned specifically for the Tracer 900 GT. 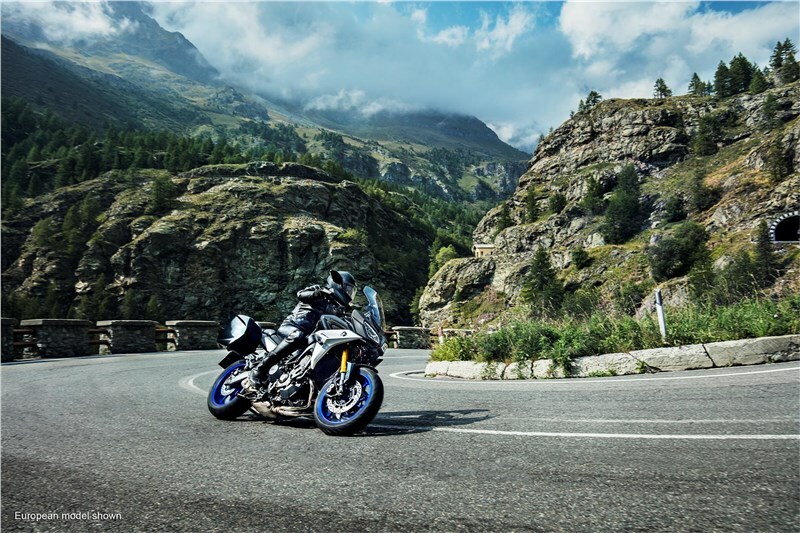 A Traction Control System (TCS) assists the rider in managing traction on various road conditions by quickly modulating throttle opening, ignition timing and fuel volume. 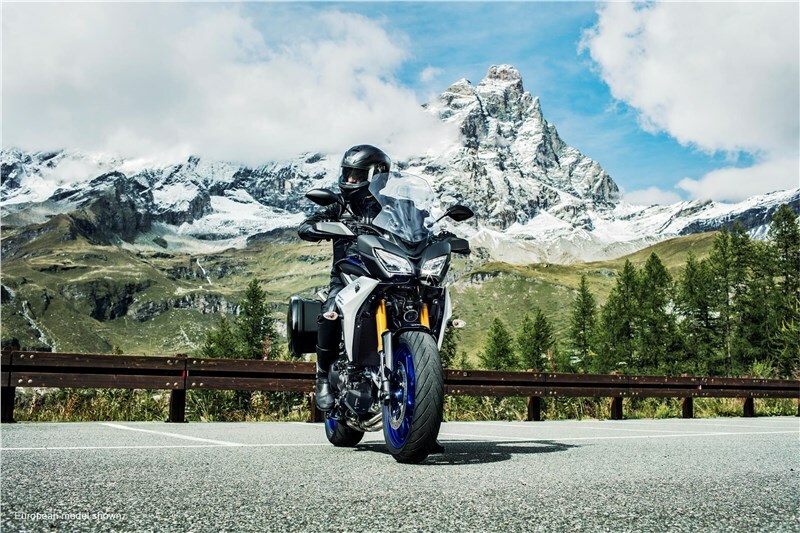 The Tracer 900 GT TCS includes three modes to suit various road conditions, and can also be disabled by the rider if they so choose. 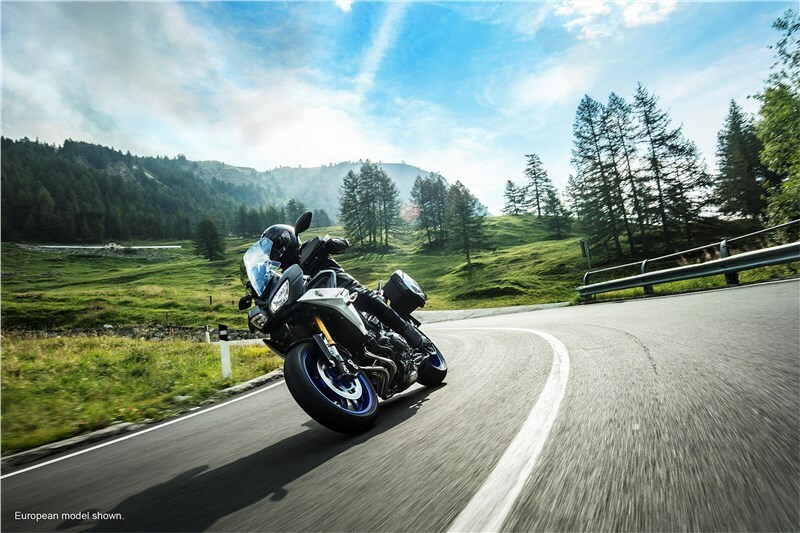 The Tracer 900 GT includes a cruise control system powered by the YCC-T. 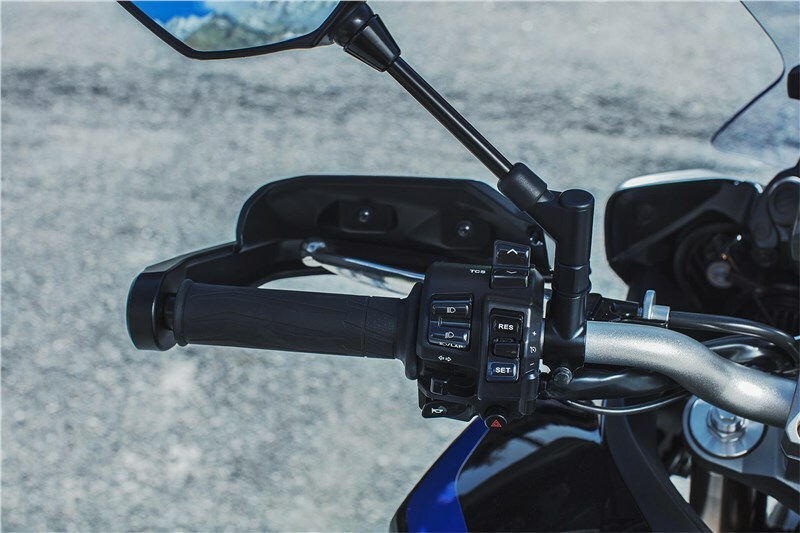 Using the left handlebar switchgear, the rider can easily select or adjust a set speed to ease long-distance touring on the highway, improving rider comfort. New TFT instruments features speedometer, tachometer, fuel level and consumption, clock, gear indicator, eco indicator, D-MODE and TCS indicators, all in glorious full color clarity. 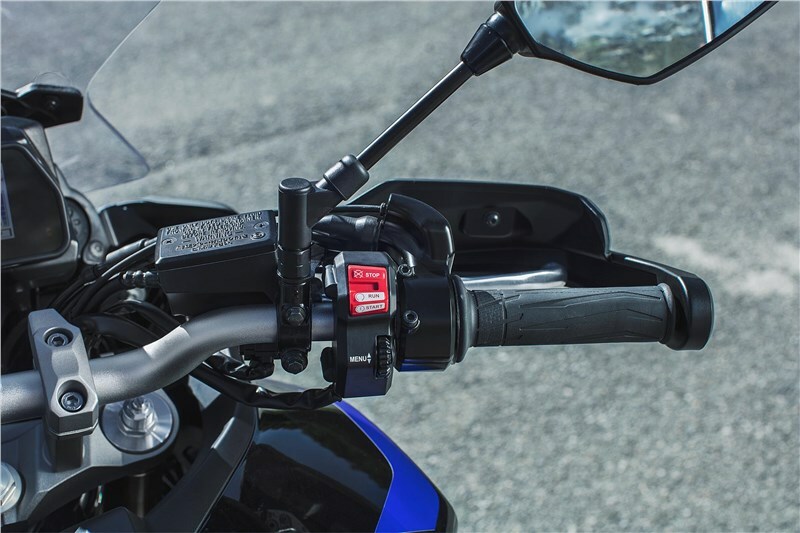 All electronic subsystems, from rider aids to heated grips, are easily controlled through the new instruments.